Come celebrate the beauty and history of Long Beach Island with LBI’s newest 36 hole miniature golf course. Nestled on the water just a long putt away from the historic Barnegat Lighthouse. Come celebrate your events out on the Links! Great for birthday parties, corporate outings or start a new family tradition with us. Enjoy an Immersive 36-hole Experience! Our Long Beach Island Miniature Golf course offers two unique 18-hole golf course experiences. We invite our guests to try out one of our courses – or both – and enjoy a day of excitement. 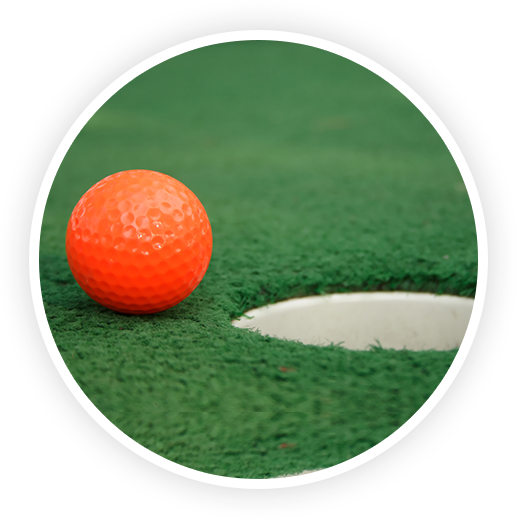 We offer ADA accessible miniature golf equipment and a golfing experience. Challenge friends, siblings, or family to an exciting adventure across 18-holes of Miniature Golf. Loser buys the snacks! Take home your yellow jacket and up the stakes with our “Masters” course. 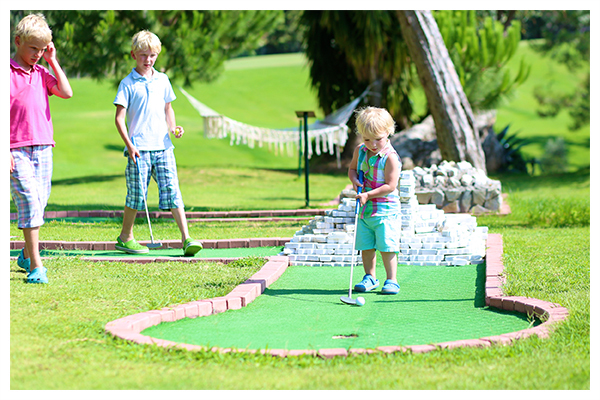 Designed for the best Miniature Golfers in town, enjoy 18-holes of excitement! See it for Yourself - Take a Photo Tour! Take a look at Long Beach Island’s best miniature golf course! Take a virtual tour of our green through our interactive photo gallery and make sure to plan your strategy to victory. Enjoy a refreshing soft drink beverage or a delicious meal after you finish playing on the best Miniature Golf courses on LBI! A sampling of our menu items are displayed below and are always available during course hours. Are you planning an upcoming birthday, corporate event, private party, or a fundraiser for your favorite local group? Rather than renting a bland bingo hall with outdated decor and force your guests to sit around circular tables trying to socialize with complete strangers, why not inject a little bit of excitement?! Jen’s Links at LBI offers a unique and exciting day with our two miniature golf courses! Let us host your guests in an engaging, outdoor outing that’ll sure slap smiles on the faces of all of your guests. We offer flexible packages – including golf and food options – for groups of 10 people or more. For more information, contact us using the form to the right! We’ve provided two sample invitations for you to use by clicking the buttons below. * Remember to use Avery 8387 postcards for printing. We are seeking responsible, enthusiastic employees to join our diverse team in advance of our grand opening! If you are interested in working at Jen’s Links at LBI, check out the open job positions below and apply! Seeking a versatile, motivated individual who has the ability to multi-task in a family friendly environment. This position will require frequent interaction with guests, setting them up with golf clubs / golf balls, and guiding them to their course. Ideal candidates should be engaging, willing to embark in conversation with all guests, and outwardly social. What is the last date you are available to work? When do you return to school? When are you no longer able to commit to a regular schedule? What shifts are you available to work (select all that apply)? Copyright ©2019. Jen’s Links at LBI. All Rights Reserved.